In the past women were excluded from politics, it was unimaginable that one day women could rule a country. Nevertheless, today in 2018, through the quota policy, the presence of women in the parliaments of several countries has increased significantly. But it is a moment to think one step further than numbers. In a representative democracy not only the number is a victory, the diversity of women matters, as the personal background of representatives. This research explores how the identity and personal experiences of representatives have direct implications on how women represent. Thus, it is necessary to re-think beyond quotas for women. This investigation focuses on the case of the National Assembly of Ecuador in the period 2013-2017. The political representation of women is analysed through the perspectives of five different Assemblywomen. Women's political representation is explored from three different angles: formal, descriptive and substantive, complemented by an intersectional approach regarding race, age, feminist identity, origin, and personal experiences. 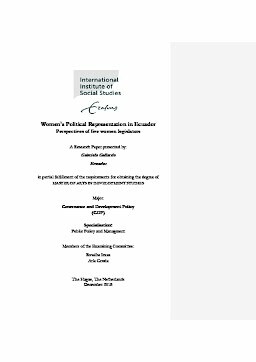 This will be used as the frame for the debate in order to challenge current notions of women´s political representation on a paradigmatic context.